Custom Cruisers UK Custom Motorcycle accessories for Metric and Harley Cruisers parts and accessories run by Mike and Tina have built up a reputation for good service on the custom motorcycle parts scene covering ALL models. Having left the forces and worked as motorcycle courier then forming his own firm in the 80's he imported Goldwings from the U.S. as well a supplying bolt on accessories for the bikes. 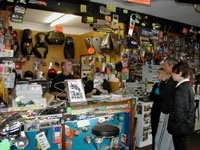 When one of their suppliers, Overland R & R Ltd who had various custom lines, went bust, Mike went to the liquidators sale. He only Intend to buy a few spotlights but seeing the extent of the stock available, he realised it could be a sizable portion of the UK. custom market.Mike then put bids in for items expecting to win a few ! Shocked to have won so much a Bank loan was needed immediatelty as Mike bought 80 percent of what was on offer plus the customer database complete with telephone numbers plus various R&R workbench spares. Mike knew if he was to get seriously into the custom market he needed to act fast, so accompanied by Tina, he went to Holland to speak to the suppliers. Having confirmed distributorship for Renegade, they also attended trade shows in the U.S, Germany and Italy. meeting many useful contacts in USA & EU complete the Package. 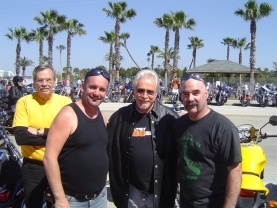 with Carl from Carl's Speedshop in the background Carl is still holds the title of the worlds fastest Harley Davidson . Custom Cruisers Shop absolutely bursting with parts and accessories. Plus top storey warehouse ensures good supply to trade and retail customers worldwide via UPS delivery ensures you your item on time. See our new range of MSD Ignition parts for Hotrods and dragsters plus Bully Dog Diesel T304 performance exhausts for american Vehicles too- add big torque and BHP just bolts on! Check our Simpson and Bandit Helmets with SA2005 SA2010 standards for motorsport with Nomex liners .plus visors helmet bags + used fire suits . See our New SUPERCHIPS Flashpaq allows engine optimisation for most American vehilces just plus in! Custom Cruisers confirmed distributorship for Renegade, HAC Products B2 plus many others they also attended trade shows in the U.S., Germany and Italy way back in 1994 . Custom Cruisers have essential expertise of knowing which part fits which bike, vital when you are dealing with bikes that have both U.S. and U.K. specifications e.g. did you know that there are over 10 different models of the VN1500 and VT750 shadows 1984 to date ! If in America/Canada please note we are at least 5 hours ahead our contact details are tel: 01144 1773 835666 fax: 01144 1773 835665. Please note, some items may be more expensive to ship as volumetric weight (dimensional) my exceed actual weight. Although every attempt is made to be accurate, errors and omissions excluded. A full range of exhausts, windshields, sissybars, seats, floorboards, clothing and much more.Rapidly expanding stocks for next day delivery. Harley Davidson, Honda, Kawasaki, Yamaha, Suzuki, Triumph, Buell, BMW and Victory. Most brands including Jardine , National Cycle , Ztechnik , Cobra , Hac , Kuryakyn , Mapam , Renegade Styling , Mustang , Corbin , Vance and Hines , Granucci and Metmachex. Plus our own range of products.